This chapter analyses the extent of the Sino-Indian diplomatic thaw since the early 1990s. Without ignoring the existence of multiple cooperation channels, or seeking to minimize the importance of the considerable achievements realized in recent years by the two governments toward normalizing their relations, the attempt here is to show that relations between the two Asian giants remain hamstrung by a series of geostrategic and economic rivalries. Despite fast growth in trade and in specific areas of economic cooperation, the normalization of ties between Beijing and New Delhi does not yet constitute a genuine strategic partnership. 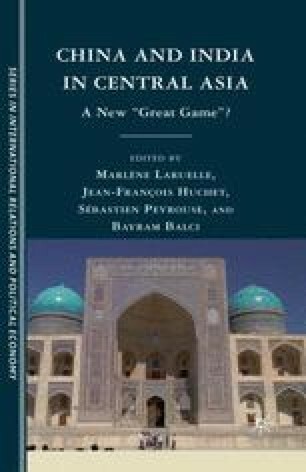 Central Asia, as a new “hunting ground” for energy resources and geopolitical influence for regional and global players, will be no exception to the current nature of the bilateral relationship: competition and sometimes conflict (though not on an open basis) will probably dominate their relationship in this region, and cooperation will be established only for pragmatic reasons.